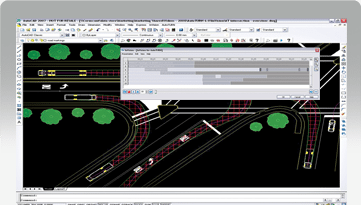 Advanced visualization software for AutoTURN. Share your concepts more readily and professionally. 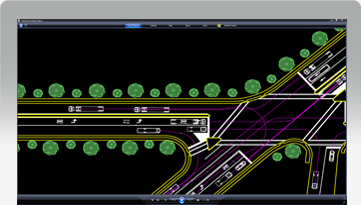 Use InVision™ to animate, coordinate, and sequence multiple vehicle turn simulations and path movement at roadway intersections, roundabouts, and traffic access points; then export them to common video files for visual design confirmation and winning presentations for clients. With AutoTURN InVision, engineers can produce animations with 3D vehicle simulations created using AutoTURN Pro within rendered terrain models for outstanding presentations. New camera angles include driver’s eye point of view. Overview UP YOUR PRESENTATIONS AutoTURN InVision gives engineers the ability to combine a number of different vehicle simulations to produce a single video file output for presentation and visual design confirmation purposes. AutoTURN InVision gives engineers the ability to combine a number of different vehicle simulations to produce a single video file output for presentation and visual design confirmation purposes. https://transoftsolutions.com/wp-content/uploads/2016/03/IV_-OUTPUTAVIVIDEOFILES-_big.png Overview OUTPUT AVI VIDEO FILES Create a presentation with AutoTURN simulations and generate an AVI file format for easy distribution and cross-platform compatibility. Post-production editing features allow the animation playback length to be compressed and saved in a selection of different video codecs to reduce AVI file size. Create a presentation with AutoTURN simulations and generate an AVI file format for easy distribution and cross-platform compatibility.